Vegetables are not what they were when I was a child. They’re really not. I remember my mother preparing silverbeet, how she would chop it up, stalks and all, and stack it three times the height of the saucepan so it looked like Marge Simpson’s hair, and put a tiny bit of water in the bottom. Then she would sit the lid way up high on the top, and set the temperature to NUCLEAR. Away that beastie would bubble, until the lid had settled in its rightful place and the silverbeet was a greenish-black mass in the bottom of the pot, reduced to two centimetres. It was bitter and somehow gritty and always went cold on the plate first, and that’s just how silverbeet was. My brother and I would each try to frame the other by dumping the offensive vegetable beneath our opponent’s chair. We weren’t particularly smart about this though; at the end of each silverbeet session we would both be perched guiltily above equal piles of the stuff, so we never actually got away with it. It wasn’t that Mum was a bad cook or anything, it was just the way that things were done back then. Vegetables were either boiled or roasted, and if you were REALLY going for variety, there was the occasional potato, baked in its ‘jacket’, because that sounded fancy. That said, I really don’t get my children’s aversion to vegetables. Food preparation has come a long way since then, and compared to the eighties, today’s food is diverse and practically gourmet. I always know they are readying for battle when Thing 2 appears beside me at the bench. “Yeurgh. DINNER? I don’t LIKE dinner!” His face is pure distaste. “What’s for dinner?” Curiosity always gets the better of this guy. He knows what’s coming. It’s a well-rehearsed act between Thing 2 and I; we know the other’s lines as well as we know our own. “And vegetables.” I reply. I am just not prepared to lie, or pretend that it is anything other than what it really is. “VEGETABLES? Bleurgh! I HATE vegetables!” He makes quite convincing gagging sounds at this point. He does skitter away but not for long, he is merely biding his time. Minutes later I notice the fridge door ajar, and promptly order him to close it. He emerges from the depths of the refrigerator and slams it shut, standing with his back to it. “I’m just CHECKING,” he tells me in a conspiratorial whisper, “that nobody is in here STEALING.” He peers out of the corner of his eye suspiciously, his lie only ruined by the guilty little milk moustache. 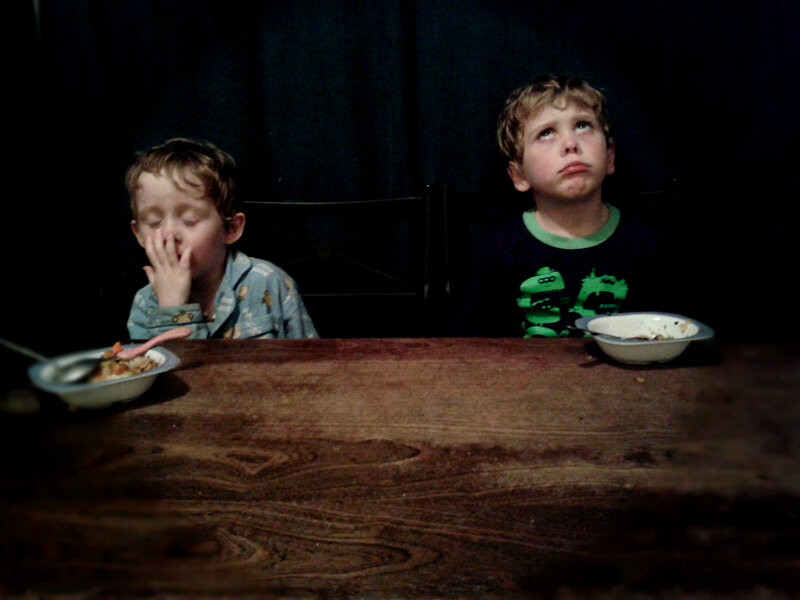 Dinner time rolls around, and the children glare sullenly at their plates. The poor things; perfectly roasted chicken with an assortment of garlicky-herb vegetables and gravy. They throw their heads back in despair, then silently pick at the chicken before returning their plates to the kitchen. I am starting to boil, not unlike the soggy silverbeet of my childhood. Silently I gather the rejected vegetables, and I suddenly know that I am going to re-feed them to the children, diguised as frittata, the next night. The next day, I am ready for battle once more. Nobody shall eat after 2pm. I shall starve them into submission! Nothing flavours food like hunger, right? Following a friend’s suggestion, I attempt to sway my children with images of starving children, which do appear to have a sobering effect on them. I am quietly confident that I have the upper hand, and around the corner I gloat to myself about this as I plate up their frittata. But as these things go, I celebrated too soon. The meal barely gets a look in, before being returned to the kitchen. “This looks like last night’s dinner, with egg all around….” Thing 1 squints. “Maybe next time you can make mine with more egg and no vegetables?” Thing 2 asks hopefully. The Baby unceremoniously dumps his bowl upside-down on the table. I address Mr 5. “Remember those poor starving children?” I can hear myself. I sound a bit desperate and needy. And to think that I actually ENCOURAGED critical thinking. Dinner was rejected again tonight, but hey. At least, with the recycled vegetables, I saved on ingredients. Thank you! It wasn’t YOUR cooking however, it was just how it was done back then 🙂 In your defense, I would like to add a that you DID try to make it nice, once you even put nutmeg in it! omg how I can relate to this liz . a constant battle and a feeling of unappreciated. joys of motherhood. Hopefully they will look back Jane, and hindsight will make them appreciate it! What clever boys you have, Liz, figuring out the frittata scam. Very perceptive about the starving children, too. My children won’t eat roast chicken or the vegetables. Soul destroying. Would yours live on crap Mel, given half a chance? Mine would!